I don't often get to meet the authors of the books I review. I do get e-mails from some about the reviews I post, but it's a rare treat to meet one in person. Today was an exception. 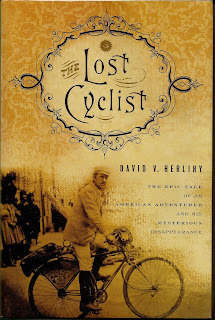 David Herlihy was here in Charlotte, promoting the second of his books on bicycling, "The Lost Cyclist" which I reviewed here in August. It was real treat. He is currently searching for that bit of inspiration to embark upon a third book about bicycling. 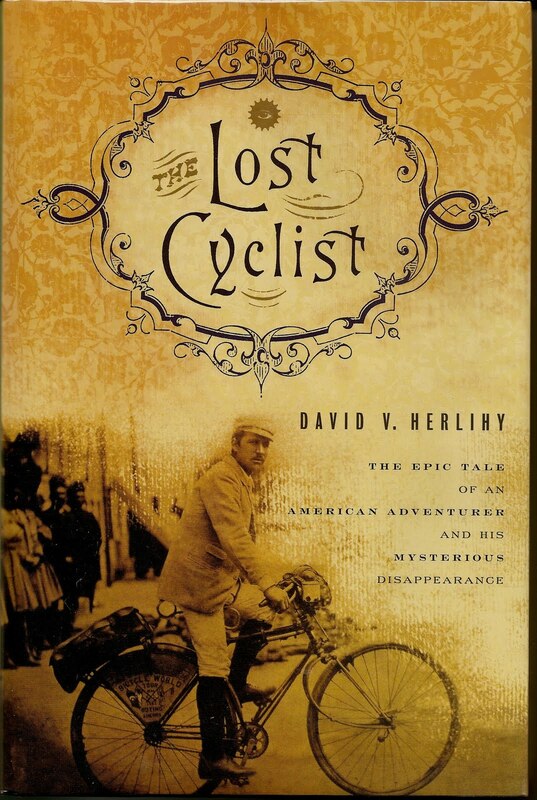 His first book, "Bicycle: The History", was met with much acclaim upon it's release in 2006. It deals with the invention and development of the bicycle. I have not read it yet, but will do so shortly. The latest, "The Lost Cyclist", was released this August and is doing rather well. Let's hope Mr. Herlihy finds that spark of inspiration soon, so that he can begin work on the next book. Meanwhile, here's a re-run of the August review of "The Lost Cyclist". It's a book well worth reading. Mr. Lenz was a bicycling enthusiast in the age of the high wheelers. These were the 6 foot tall, hard rubber tired cycles that were so popular beginning around the 1870’s. These cycles were powered by pedals attached directly to the front wheel. That was “direct drive”, which although simplistic in its form, allowed a hearty rider to attain some serious speed and distance. A wheel which is six feet in diameter will cover considerably more distance with each turn of the pedal than a modern bicycle could, were it not for the addition of “gears.” But falling from these older contraptions could be serious, and in some cases fatal. In the 1880’s people began to experiment with what came to be known as the “Safety” bike, which is the forerunner of today’s bicycles. They look identical, were made of tubular steel, had chain and sprocket drive, inflatable tires, front and rear breaks, reduction gears and were easily mounted due to their height of approximately 36 inches atop two 27 inch inflatable tires, as compared with the 6 foot high cycles of the earlier years. After mastering the art of the 6 foot high cycles in races and road trips, Mr. Lenz was more than eager to plunge head first into these new “safety” bicycles. Continuing to run in local cross country races during the 1880’s, he came to the attention of the public, who responded enthusiastically to this new sport. So, eventually “Outing Magazine” sponsored a bicycle trip around the world, and Mr. Lenz was hooked. The round the world trip had already been done on a 6 foot cycle by a man named Thomas Stevens. I’d tell you more about him but don’t know that much beyond what I have read in “The Lost Cyclist.” I will google him later, on that you can be sure. Frank Lenz began training for this eventual race with a partner named Petticord. They took several road trips, one down to New Orleans in 1890 and another one to St. Louis. Being an amateur photographer allowed Mr. Lenz to photograph the trips. Using a cord that ran to the camera’s shutter he was able to capture images of himself and Petticord sitting atop boulders, lounging in a hotel room and even along the roads. In May of 1892, Mr. Lenz finally left his job as an accountant to embark on this amazing journey, from which he would never return. But along the way he filed articles with “Outing Magazine”, so we have a pretty good idea of what his journey was like. He traveled East to West from Pittsburgh to San Francisco, where he caught a ship to Hawaii. From there he shipped to Japan and then on to China and Burma. This journey would be difficult even today. Making this trip in 1892 is mind boggling. From Burma he went through India and across present day Kuwait, Iraq, Iran and there his trail ends. He had shipped his trunks ahead to Constantinople, where they were later recovered by his friend William Sachtleben. But Lenz himself never did arrive there. The book has an abundance of photographs, some taken inside the Coliseum in Rome, wearing a Pith helmet as he arrives at the gates of Tehran, and others of Lenz standing with some Chinese on the way to Peking. The Chinese were especially enamored of his bicycle, and though there were several unpleasant incidents while traveling through the country, he found the Chinese, on the whole, to be quite gracious and accommodating. When he disappeared, presumably in Armenia sometime in 1894, “Outing Magazine” sent William Sachtleben to find him. When he arrived in Turkey, he landed in the midst of a very tender political situation concerning the Turks and the Armenians. Having no luck with the American Minister there, a former Confederate Colonel, named Alexander Terrell, who can only be described as arrogant and lazy, he turns to a Canadian Missionary named William Chambers, who had based himself in Erzurum province, where he had founded a missionary school and a church. Making the task more difficult was that Armenia, especially the area around Bitlis, had been sealed off by the Turkish Government. This area was the site of some of the worst ethnic violence in the history of Turkey, culminating in the “ethnic cleansing” of some 15,000 people by the following summer of 1895. That he was able to track Lenz at all is somewhat of a miracle in itself. That he was able to figure out what happened to his friend is incredible. His attempt to prosecute those whom he believed to be behind Lenz’ disappearance is amazing. Of the 5 Kurds who were accused and imprisoned for the killing of Frank Lenz, two perished in prison, and the others have gone missing in the annals of history. That Mr. Sachtleben did not succeed in his effort to seek justice was predictable, but no less admirable for his having made the effort. He also went on to complete his friends journey, traveling through Turkey, amd on through Europe, then crossing the Atlantic before riding back into Pittsburgh the following year. This book is a testament to the Human Spirit and those who dare to go where no one else has gone before. Without them the world would be a much different, and less vibrant, place in which to live.